Kunda eventhough he has a medicore base HP, he makes up of it by having a decent defence. However, Kunda is still food. He is not that helpful in any other than necropolis. He is quite handy in handling necropolis dungeon because his basic skills, attacks an enemy 2 times. And also his 2nd skill is also a multi attack thus makes him an ideal monster for Necropolis dungeon farming. Other than this, he is pretty much useless. 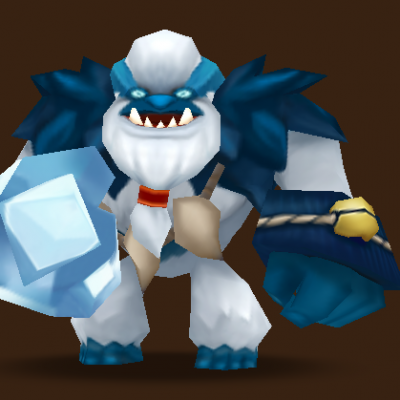 The first skill and second skill is basically identical to all other yetis. His third skill differentiates him from the rest. Basically he grants Immunity to all harmful effects for 3 turns and reflects 30% of damage back to the enemy. And also using this skill removes all harmful effects. The cooldown of this skill is pretty low, its only 3 turns @max skills. Consider having unlimited immunity. I would recommend to rune Kunda with Violent Revenge with HP/DEF/DEF on slot 2/4/6 respectively. So where you can use Kunda? Kunda is ideal to farm nercropolis dungeon.